Jeff Thompson is an internationally acclaimed artists, born in New Zealand, who’s approach to life, art and environment came about through the discovery of an ancient pursuit — walking. Whilst walking the rural and urban paths near Dunedin, NZ, he started observing and collecting the wealth of highway paraphernalia that he found along roadsides. These experiences culminated in the rural letterbox sculptures that gained him national recognition; it was through this letterbox series that he came face to face with his chosen material — corrugated iron (Thompson, n.d.), exploiting its rustic charms and sculptural malleability. Corrugated iron plays a strong role in the collective memory and history of European settlement of Australia. As a material of the industrial and colonising age, it has been a crucial part of our frontier and mining adventures; it has been described as the ‘building material, which made the bush’ (Discover Murray River, 2016). Corrugated iron is economical and easily transported across vast distances; it is versatile and can be reused when temporary structures outlive their purpose. It suits harsh natural conditions where practical improvised solutions are needed (Mornement & Holloway, 2007), and its rusted, weathered forms blend in particularly well with the hues and textures of the Australian landscape. As a material it has been used by Indigenous Australians, who referred to it ‘the white man's bark’, to build traditional shelters such as windbreaks and humpies. A number of Australian artists have gown fond of this material, interpreting its history and exploiting its associations, e.g. Russel Drysdale, Jeffrey Smart, and Rosalie Gascoigne, for whom it presented as a source of visual poetry and became a signature artistic medium that she found particularly evocative of the Australian landscape (Discover Murray River, 2016). 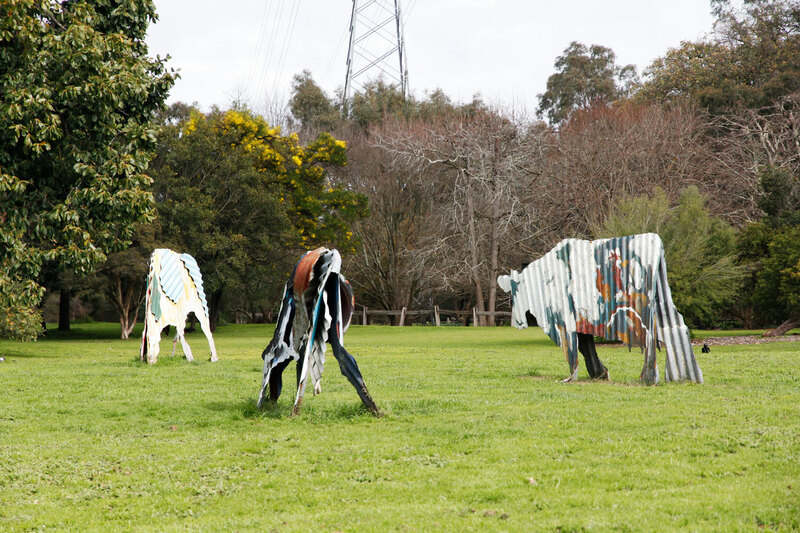 Jeff Thompson’s Cows, constructed from recycled corrugated iron, cut, formed and welded, and painted in synthetic polymer, were a part of a herd of 15 cows made in Hawke’s Bay, NZ and exhibited at Heide in 1987. Three were purchased by Heide, two by Barrett Reid, and subsequently acquired by Heide as part of the Barrett Reid Bequest, 2000 (Heide Museum of Modern Art, n.d.). The Cows allow us to reconnect with Heide’s history as a dairy farm, as well as John and Sunday’s penchant for food that was heavily sauced in the French tradition — butter and cream were essential constituents in many recipes (Harding & Morgan, 2010). 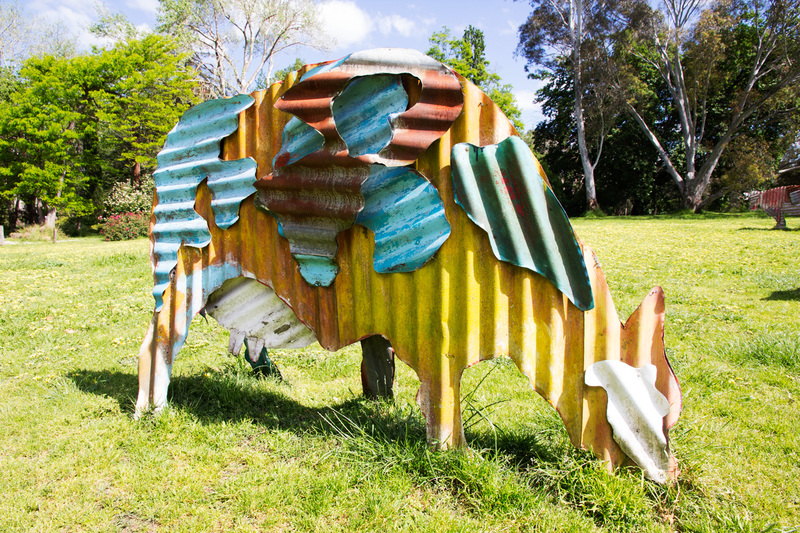 These sculptures also open up conversations about the impact of cattle on land as well as highlight the popularity of corrugated iron as universal building material in colonial times. Close your eyes — and imagine and visualise the sound of rain on a tin roof — what memories or stories does this picture evoke? Describe them. How do they make you feel? Do you think corrugated iron is a sustainable material? Why or why not? What aspects make it sustainable, what are its limitations? Heide was originally a tree-covered bush, thereafter a dairy farm, rendering the landscape practically treeless — what are some of the immediate and long-term impacts of cattle farming on the ecosphere? What does Heide look like now? Would it be still a suitable place for cattle farming? Why or why not? Do you think eating butter and/or cream is sustainable? Why or why not? Mornement, A., & Holloway, S. (2007). Corrugated iron: building on the frontier. New York: WW Norton and Company.